The scapula is a relatively common site for primary bone tumors, including chondrosarcoma and renal-cell carcinoma in adults and Ewing’s sarcoma in children. Soft-tissue sarcomas may arise from the suprascapularis or other rotator cuff muscles and may secondarily invade the scapula. Tumors arising from the scapula are often initially contained by muscle, thereby protecting other tissues. Important anatomic areas to evaluate for tumor extension are the chest wall, axillary vessels, brachial plexus, proximal humerus, glenohumeral joint, and rotator cuff. Shoulder motion and strength are nearly normal following a partial scapular resection (Type II). However, there is significant loss of shoulder motion, predominantly shoulder abduction, following a total scapular resection (Type III), alone or in conjunction with an extra-articular resection of the shoulder joint and proximal humerus (Types IV and VI). Suspension of the proximal humerus and meticulous soft-tissue reconstruction are the keys to providing shoulder stability and a functional extremity. 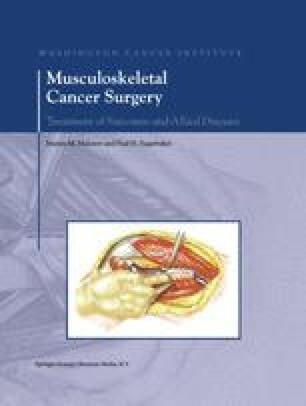 If significant periscapular muscles remain following tumor resection (especially the trapezius and deltoid muscles), a total shoulder-scapula prosthesis may be the optimal reconstructive option. This chapter discusses the anatomic and surgical considerations of limb-sparing scapular resections and describes the techniques of resection and reconstruction. Additional information regarding the indications and contraindications of limb-sparing resection, surgical staging and classification, endoprosthetic reconstruction and design features, and functional and rehabilitation considerations may be found in Chapter 9.